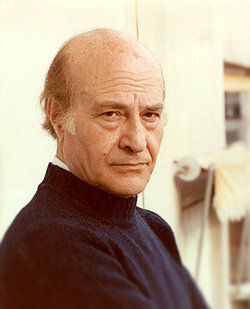 Odysseus Elytis (also Elytes, Greek: Οδυσσέας Ελύτης, original surname Alepoudhelis), was a Greek poet and Nobel Prize winner. Elytis was a descendant of an old family of Lesbos. He was born in Heraklion (Candia) on the island of Crete, on November 2, 1911. Some time later his family settled permanently in Athens where the poet finished his secondary school studies and later visited the Law School of the Athens University. He abandoned the family name as a young man in order to disassociate his writing from the family soap business. He first appeared as a poet in 1935 through the magazine "Nea Grammata" ("New Culture"). This avant-garde magazine was a prime vehicle for the "Generation of the '30s," an influential school that included George Seferis who, in 1963, became the first Greek Nobel Prize winner for literature. The new style Elytis introduced - though controversial - succeeded in prevailing and effectively contributing to the poetic reform which commenced just prior to the Second World War and continues to the present. In 1937 he visited the Reserve Officer's Cadet School in Corfu. Upon the outbreak of the war he served in the rank of Second Lieutenant, first at the Headquarters of the 1st Army Corps and then at the 24th Regiment, on the advanced fire line. During the German occupation and later, after Greece was liberated, he has been unabatedly active, publishing successive collections of poetry and writing essays concerning contemporary poetry and art problems. He became something of a bard among young Greeks; one of his poems, "Asma heroiko kai penthimo gia ton chameno anthypolochago tes Alvanias" ("Heroic and mournful song for the lost Second Lieutenant of the Albanian Campaign"), became an anthem to the cause of freedom. After the war he lapsed into literary silence for almost 15 years, returning to print in 1959 with "To Axion Esti" ("Worthy It Is"; The Axion Esti), a long poem reminiscent of Walt Whitman's Song of Myself. He was twice Programme Director of the Greek National Radio Foundation (1945-46 and 1953-54), Member of the National Theatre's Administrative Council, President of the Administrative Council of the Greek Radio and Television Service as well as Member of the Consultative Committee of the Greek National Tourist's Organisation on the Athens Festival. In 1960 he was awarded the First State Poetry Prize, in 1965 the Order of the Phoenix Brigade and in 1975 he was proclaimed Doctor Honoris Causa of the Philosophical School of the Thessaloniki University and Honorary Citizen of the Town of Mytilene. During the years 1948-1952 and 1969-1972 he settled in Paris. There, he listened to philology and literature lessons in the Sorbonne and got acquainted with the pioneers of the world's avant-garde (Reverdy, Breton, Tzara, Ungaretti, Matisse, Picasso, Chagall, Giacometti). Starting from Paris he travelled and visited subsequently Switzerland, England, Italy and Spain. In 1948 he was the representative of Greece at the "International Meetings of Geneva", in 1949 at the Founding Congress of the "International Art Critics Union" in Paris and in 1962 at the "Incontro Romano della Cultura" in Rome. In 1961, upon an invitation of the State Department, he traveled through the U.S.A.; and - upon similar invitations - through the Soviet Union in 1963 and Bulgaria in 1965. Elytis' poetry has marked, through an active presence of over forty years, a broad spectrum. Unlike others, he did not turn back to Ancient Greece or Byzantium but devoted himself exclusively to today's Hellenism, of which he attempted - in a certain way based on psychical and sentimental aspects - to build up the mythology and the institutions. His main endeavour has been to rid his people's conscience from remorses unjustifiable, to complement natural elements through ethical powers, to achieve the highest possible transparency in expression and to finally succeed in approaching the mystery of light, "the metaphysic of the sun" - according to his own definition. A parallel way concerning technique resulted in introducing the "inner architecture", which is clearly perceptible in a great many works of his; mainly in the Axion Esti - It Is Worthy. This work - thanks to its setting to music by Mikis Theodorakis - was to be widely spread among all Greeks and grew to be a kind of the people's new gospel. Elytis' theoretical ideas have been expressed in a series of essays under the title (Offering) My Cards To Sight. Besides he applied himself to translating poetry and theatre as well as creating a series of collage pictures. Translations of his poetry have been published as autonomous books, in anthologies or in periodicals in eleven languages. 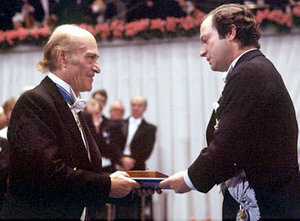 On October 18, 1979, Elytis won the Nobel Prize for Literature. He accepted the award on December 10 from the King of Sweden. The following year, he donated the medal and diploma associated with his prize to the Benakis Museum. He died on March 18, 1996 of a heart attack. This page was last edited on December 10, 2010, at 13:58.